My edition: paperback, to be published on 13th March 2014 by Avon, 384 pages. And one man who'll melt Alice's heart. 'You need to get back in the saddle…' Alice despises that phrase. She's fine being single – with two slothful teenage boys and a meringue business to run, she has enough on her plate without negotiating the troublesome world of modern dating. However, Alice's three best friends have other ideas. Each one will present her with an utterly delicious, eligible man – all Alice has to do is pick her favourite. Spoiled by a wealth of stunning book covers lately I've become a bit of a snob and I easily disregard a novel as "not interesting" if the cover doesn't particularly appeal to me (ie. doesn't have any embossing, sparkles or a really stunning image). 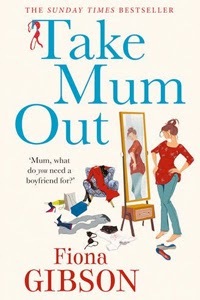 And unfortunately I didn't like the cover for Take Mum Out - which seemed a bit plain and old fashioned to me. Now there's nothing wrong with that of course, but it simply wasn't my cup of tea. Thankfully however, this truly was one of those instances where you shouldn't judge a book by its cover and it's been a reminder to me to be less snobbish about how a book looks, as of course it's the content that matters the most. In fact, I was pleasantly surprised by this novel book overall. The cover and blurb made me assume this would be quite a straightforward and predictable chick lit and easily forgettable, yet it turned out to be a much more enjoyable and memorable read than that. I really liked the character of Alice and reading about all the dates she had to endure to find a Mister Right was delightful. The situations she found herself in went from dreadful to ridiculous - with a wealth of laugh out loud moments in between. What also appealed to me within this novel was the fact that Alice runs a meringue business from her home and so there were plenty of mentions of scrumptious baked goods running through the pages - which is always a bonus in my book! In the end I was so gripped by Alice's story that I finished the book far too little in the middle of the night, when I definitely should've gone to bed as I had work the next day. It's been a while since a novel had me in its clutches like that so that is definitely a testament to how much of an enjoyable read this was. I also really liked author Fiona Gibson's writing style. It's witty, fun and often hilarious - making something that could've been an average or even dull read, a delightful addition to any relaxing Sunday afternoon. Take Mum Out is perfect not only to gift your mum on Mother's Day, but also to gift to yourself. Indulge in a nice cup of hot chocolate, put your feet up and get ready for a few hours of relaxation with a funny and charming read.